Spring time at area high schools means the start of outdoor activities like baseball, track and field and tennis. But for many teens, the warmer weather also signals the start of "Nerf war" season, a game that has police, prosecutors and school officials trying to figure out how to best keep students safe. 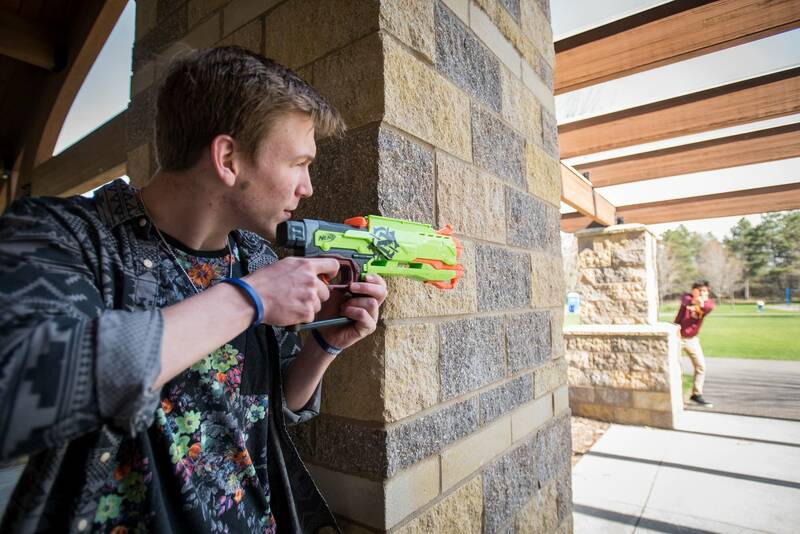 On a recent day, Dan Wong, a senior at Blaine High School — armed with a multicolored Nerf gun — was facing off with a classmate recently at Bunker Hills Regional Park. It wasn't a real match; it was just a way of showing off some of their Nerf skills. If it were an actual match, the winner would have been awarded points, with the results then posted on Twitter. Tournaments are held in the spring, and winning teams earn a cash prize made up of money from a pool of small entrance fees. Wong says the money makes for good incentive to join in, but there's also the camaraderie. "It's almost like an extended field trip," he said. "You're out there with friends and people from the school." But you're also trying to "assassinate" them. And the intensity of the game can push the boundaries too far — there have been cases of competitors chasing each other down in cars or entering homes without permission. That worries people who work in law enforcement and schools. A year ago police chiefs around the state warned the game caused a number of car crashes. In late 2015, two Lakeville South teens were killed in a rollover crash in which authorities say "Nerf wars" played a role. Edina police are currently investigating an incident where a man in a parking lot allegedly pulled a handgun on a group of teens who were playing the game in a nearby business. Ramsey County Attorney John Choi says adults need to do more to make sure kids aren't in dangerous situations. In March, he issued a letter to superintendents in the county, asking them to raise awareness about the dangers of the game. "There's a fork in the road and you can take two paths," Choi said. "One of which is — we don't allow this on our school grounds and what kids do off site is not our responsibility. The other approach would be that we care about the health and safety of all of our kids." Steve Nanney, the school resource officer at Blaine High School, says with the games being played off school grounds, it might be the parents who need to take more of a leadership role, instead of waiting for police and principals to say something. "Once the kids get home, the school doesn't have any more overreaching power to do any discipline or anything like that," Nanney said. Nanney says based on what he's seen in Blaine, kids are already tuned into the idea of keeping things under control. The students who run the competition there say if a player doesn't follow the rules of keeping it off the roads or private property, that person is kicked out of the game. The rules can be very strict, and there are intricate levels of organization to the game. 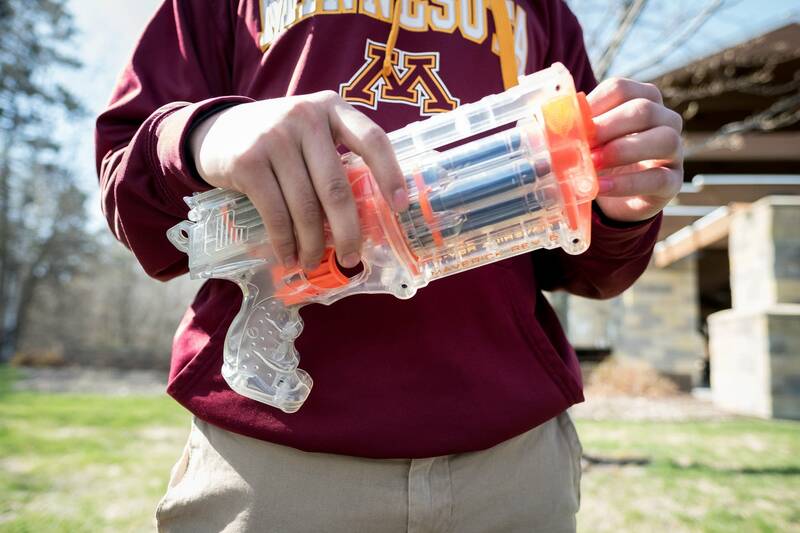 Luke Berge, a sophomore at Edina High School, is the unofficial commissioner of "Nerf wars" for his grade level. He says high profile incidents have prompted stricter enforcement, and given the reports of what happened in the Edina parking lot, he says the conversation should go even further. "In a way, I feel like educating the community about the game, definitely does help the situation," he said. Berge said that's why he posts warnings about potential matches on community social media accounts like Nextdoor. But even with students acting more responsibly, Choi says adults still need to step up this spring. "I think in the context of how this game is played by young people, their judgment and all of that is not as developed," Choi said. Choi and other concerned groups say players might get too wrapped up in a fantasy world of assassins, before they realize they put themselves or others in harms way.